HOMEMADE BERRY LIQUEURS Today's Infusions? Raspberry and Blackberry! Homemade berry liqueurs are a great addition to your bar and they are so easy to make there's no reason not to start adding a collection of your favorites to happy hour. It's just a matter of picking your favorite berries, adding 2 more ingredients and giving them some time to infuse. You can use fresh or frozen berries, pick one or make some combos, it's your creative choice. My two choices this time were individual bottles of raspberry and blackberry. Primarily because berries were on sale and I can only eat and cook with so many before they go bad! If you're using fresh berries, just make sure that there is no mold or soft spots and they are properly cleaned and dried. Frozen berries, without added sugar, are ready to use as is. All you need next is some good quality vodka. 100 proof spirits are best because the higher proof draws more flavor out of the berries quicker, but 80 proof works too. I find the 80 proof makes a milder sipping liqueur. You can also infuse rum, whiskey and brandy and a vodka base with a bit of brandy added can be a nice touch as well. 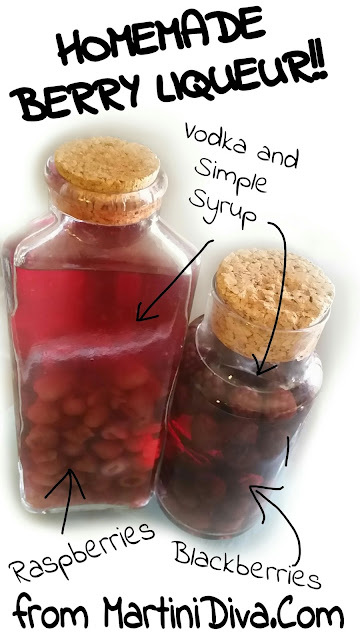 Directions Add the berries to a large, sterilized mason jar or capped bottle. Pour in the spirits. Shake daily and allow to infuse for 3 weeks. Add the simple syrup, continue to shake daily and allowed to infuse for another week or two, taste testing for flavor. Strain through cheesecloth (save the berries!) into a sterilized, caped bottle. For extra depth of flavor and smoothness allow this to infuse for another week or two. Remember I told you to save the berries? That's because these beautiful alcohol-infused berries are great as toppings on ice cream, pound cake and even pureed as a sauce. One tip, while infusing you will notice that the color might get drained from the berries along with the flavor so add some fresh or frozen berries to the boozy ones to put that color back in. * Rich simple syrup is simply two cups of sugar and 1 cup of water heated until the sugar dissolves to create a syrup. Once the sugar has dissolved remove the simple syrup to cool then bottle. This will keep in your refrigerator for up to 2 weeks. Unless otherwise noted, all images are copyright protected - please do not copy, download, print, duplicate, link to them, use them on your blog, website without written permission. PLEASE! Drink and Drive Responsibly! All postings and original art, unless otherwise noted, are by MartiniDiva.Com or PopArtDiva.com, copyright 2000-2019. All Rights Reserved. This blog is for entertainment only. The Author shall not be held liable for damages arising directly or indirectly here from. All links provided are for the convenience and amusement of the blog visitor only and not to be construed as endorsements of any form.